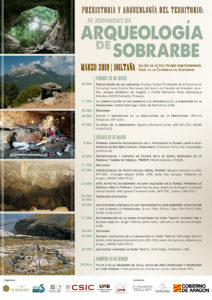 On March 22, 23 and 24, 2019, the IV Jornadas de Arqueología en Sobrarbe will be held in Boltaña. Coordinated by Ignacio Clemente-Conte from ASD-CSIC group. On this occasion, general conferences will be presented. The first day the themes are centred around economic activities developed by prehistoric societies: herding, agriculture and fishing, to understand how these productive processes arise and develop. The second day will be devoted to the presentation of the results of the last works developed in Sobrarbe: the first archaeological campaign in the “Plano Lenar” site or Sampetrillo de Boltaña, the surveys and excavations in the Pardina ravine and Góriz and the excavations carried out in Coro Trasito. The third and final day will offer a series of visits to archaeological sites upon registration. Check the full program of the Conference.